Pearl River Community College Selects Steinway Model "D"
Matching the same level of excellence as the Brownstone Center, Pearl River Community College Professor of Piano and Instructor of Music Janice Hope McKellip and Instructor of Music, Choral and Vocals LaDona Ferguson Tyson joined Steven Kinchen from Hall Piano Company on a trip to the Steinway & Sons Factory in Queens, New York to select their new Model “D” concert grand piano. The selection trip took place on Friday, October 17th, and included a private tour of the Steinway Factory at One Steinway Place, Long Island City (New York, 11105) including observing the bending of a 9ft concert grand piano rim. To be housed in the newly opened Ethel Holden Brownstone Center for the Arts, the choice of this Steinway concert instrument was the product of perseverance, enthusiastic pursuit of funding, and tenacity on the part of Archie Rawls, Department Chair, along with support from Steve Kinchen, co-owner of Hall Piano Company. Despite the offer of lesser pianos for a more modest price, Mr. Rawls remained steadfast to the commitment of excellence for his department, and to the selection of a Steinway grand piano for the Brownstone Center. His wish is to inspire the next generation of music makers that will attend the PRCC, and to provide the staff, students and community with the finest instrument possible to perform with on their concert stage. Hall Piano Company has served the region since 1958. 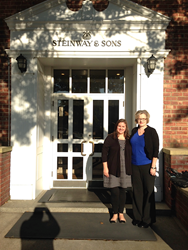 As south Louisiana’s premier Steinway & Sons dealer, their services include piano rentals and sales, acoustic and digital piano sales, piano lessons and method books. For additional information about the Pearl River Community College Steinway selection, contact Emily McWilliams at emilym(at)hallpiano(dot)com or call 504.733.TUNE.